We’re a small privately owned company based in Melbourne Australia creating games exclusively for the iPhone, iPad and iPod touch. Our goal is to make fun games that people can’t put down and that represent great value. Our games will have the highest production values, play great, look and sound great, be stable and efficient in their implementation. We want to support our customers so expect updates adding features to our games to continue bringing you great fun and value. Individually we’ve been making games for 10 years. Over those 10 years we’ve worked on various platforms including PC, PS2, XBox, PS3, Xbox360, Wii, PSP and iPhone and iPod touch. Genres include sports titles, children’s titles, first-person shooters, third-person action titles, GTA-open world style, puzzle games, platform God of War style games. Our experience across so many genres and platforms has prepared us well to deliver quality experiences to you our customer. 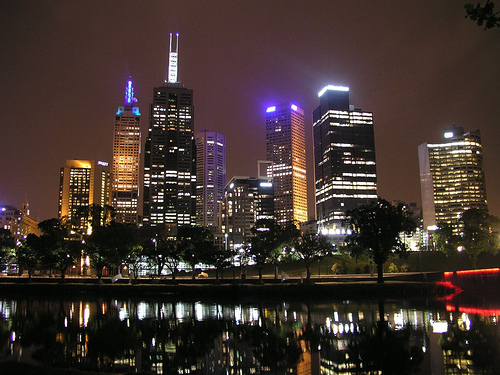 The eastern end of the Melbourne CBD at night from the bank of the Yarra River.